Mosura Excel is formulated for fast growth and maturation of algae eating shrimp species like Crystal Red Shrimp and Red Bee Shrimps. It has a 50:50 ratio of animal to plant content. Molting enhancer is added into Mosura Excel. This additive is very important, it prevents molting problems and result in faster growth rate. It contains the wholesome goodness of seafood such as green lip mussel, squid derivatives and oysters. The plant content is made up of spirulina, kelp, terrestrial plants and their derivatives. These carefully selected ingredients provide essential nutrients like beta-carotene (important antioxidant), choline, phospholipids (e.g., phosphatidylcholine and phosphatidylinositol), fatty acids, cholesterol, minerals like iodine, potassium, calcium, selenium and plant and animal proteins. Vitamin A & D, stablised form of Vitamin C & E and astaxatnthin are added together with Omega-3 and Omega-6 Fatty Acids (ratio of 2:1). These nutrients have been found to be increase their resistance to diseases, fast growth and maturation of female shrimps. 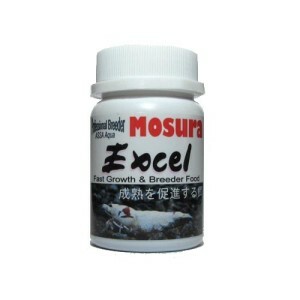 Mosura Excel eliminates the need to use live food to promote the growth and maturing of females. 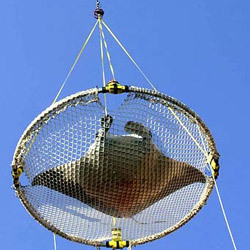 In this way it avoids the parasites and diseases that may come with live food. Please use ASSA Feeding Regime Matrix on suggested feeding frequence between Mosura Excel, Mosura CRS Specality Food and Starve Day.